Art-Customer Decision Journey - Vaxa Inc.
Let's think about it for a moment. When we make a purchase, we go through a series of different physical and mental steps. Depending on the duration, you don’t just end up looking for a product and buying it on a whim. It starts with the person or company recognizing they have a need, seeking & comparing solutions, and finally, make a conscious decision to buying, then making the purchase. It a definite process, whether it is made by an individual or a corporation. Once purchased, we experience the product or solution and make a mindful decision whether we want to repurchase from that organization. Understanding this buying behavior is crucial for many different reasons--from having more predictable sales, helping those selling to understand customers' influencers including partners performance, and investments.. This is particularly true for B2B companies. The customer decision model has never been a serial process, however, it has been perceived in that way for the sake of simplicity. Historically, it was described and discussed in a linear form but it doesn't mean the process was ever sequential and there are parts it that is clearly circular and self-reinforcing. The following four steps are how it has been perceived. Awareness: Customer search for products and service based on an unmet need, want or desire. They solve their problem by doing research in different forms--talking with colleagues to using internet searches and, in the consumers' case, using Amazon consumer reviews. Their goal is to become aware of their options. Consideration: As we become aware of the options, individuals and companies start to align their needs with what they have become aware off. There is often preconceived notions and boundaries that come into play like price, features, quality levels, and so on that go to satisfying the original need. Preference: Customers start to gravitate and create preferences for particularly solutions as they become educated and start to make trade-offs between their need and want, affordability and quality, and other factors. Purchase: Once customers become relatively comfortable that they have found a solution to their need, they will often move ahead with the purchase and start consuming the product or service. However, the process doesn't end when a purchase is made. Customers' experience of the product becomes a gating factor of their perception of the company who sold them the product and more often than not a strong indicator whether they will buy again from that company. That said, customers sometimes do not have a choice of where they buy from the same company especially when there is limited choices as in the case of cable services, when it is limited to one main player. Customers of today have a wider choice of what they buy, from whom, when, where, and how much. Almost all products and services are being affected by the pervasiveness of choice which increases competition. Therefore, how we view customers and their buying habits need to rediscovered in the face of more sophistication on how we shop for low to high end items and commodities to specialized goods. One major goal in marketing is simply to reach customers and to help them to make a purchase of your product--and to repurchase time and again. As discussed above, the old purchase decision model has been discussed and marketed as linear, when, in fact, it has been circular all along. We have also been aware of the importance of loyalty and the influence of the post-purchase decision to ensure we have repeat customers. However, repeat customers do not necessarily equate to loyalty. 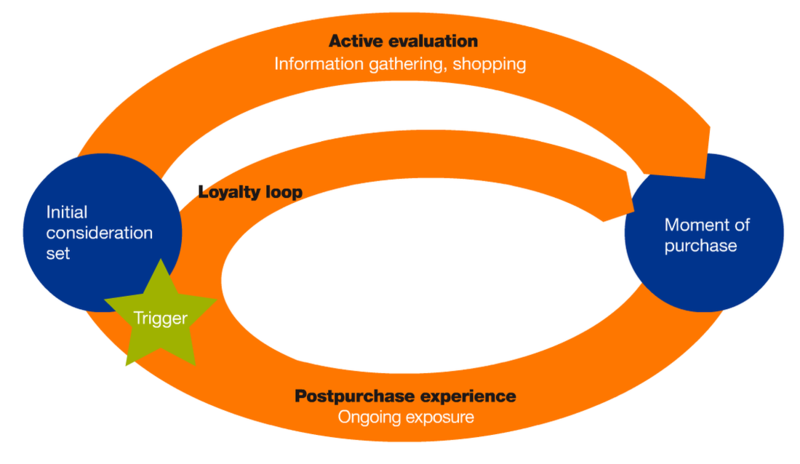 This enhanced view of the customer decision model takes what we have been running with and put more emphasis on the loyalty loop. Where we are today is placing as much emphasis on the initial purchase as one should put on the loyalty as without an initial purchase there is no loyalty to be had. This is not so much a major shift in thinking but becoming more aware that in a highly competitive market places that the cost of customer acquisition is increasing as the information sources that influence what and how customers thinking are becoming more fragmented. 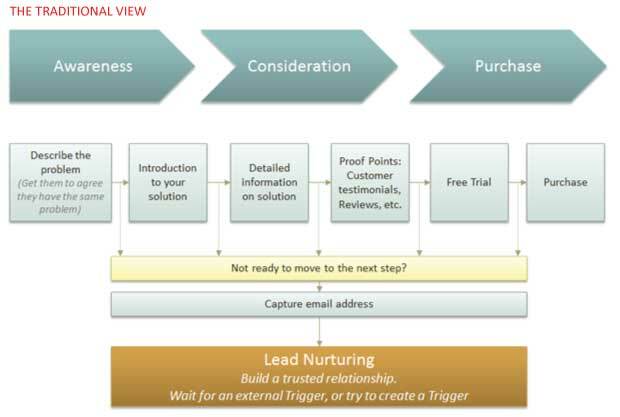 There are three ways to increase sales by looking at the customer decision model different from the linear past. It is a simple point and one that has wide implications if we don't have enough information about the top of mind issues customers are facing. It is not always the big picture issues like increasing sales and reducing cost and it can be different issues at different times. Walking in the customer shoes provide a window into what type of solutions is appropriate, where and to whom they look for information to aid in their decision making. Large companies behave different from their SMB counterparts. Finance is a leader with corporate buyers who would then look to reduce costs and increase efficiency while smaller companies will be led by tech-savvy entrepreneurs who want to know the workings of new developments. In each case, they want different information to finalize a decision and will look at different sources to gather data. Understanding what drives customer decisions means that marketers can make smarter, more informed decisions about where to allocate resources. Prior to using CDJ methods, the sales and marketing team at a large materials company did what it did best: nurtured long-standing key accounts and kept tabs on new opportunities within two of its biggest verticals, the government sector and commercial real estate developers. It was a sales forward approach focused on generating and qualifying the lead, making the pitch and closing the deal. Still revenue growth remained lackluster. So their commercial leaders analyzed their customer base, interviewed key players, and came away with a better idea of where to focus its resources along the CDJ. If it was going to win the public sector, for instance, the company realized it had to broaden its appeal and court relationships not just with public works officials, but to local distributors as well since interviews had shown most facilities managers turned to them for recommendations and advice during the research stage of the CDJ. This insight told sellers not only where and when to redouble their relationship-building efforts, it also told marketing where to pull back, such as in trade show spend, which research showed had little influence on the buying outcome. We’ve seen adoption of the CDJ also address a nagging issue in many B2B organizations: poor communication and coordination between marketing and sales. By developing a common understanding of the CDJ and those battlegrounds where they needed to compete for customers, marketing and sales can communicate more clearly and focus more effectively on activities that win customers. Without understanding your customer’s decision journey, it doesn’t matter how “customer-centric” you are. Building your organization and programs around the CDJ model means more effective marketing and more successful sales. Let's discuss how we can help you fold MegaTRENDS into your strategy.